Our one day Bryce Canyon tour also tours Zion, on the way to Bryce. If all you need is transportation, the Grand Canyon bus, the Bundu Bus, travels to and from Zion on a daily basis. 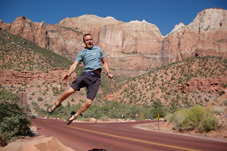 Zion park tours are offered from Las Vegas and Salt Lake City. You can either take a one day Zion national park tour, or a multi day Zion trip. Zion National Park is Utah's most popular national park, and its story is simple, yet complex. It's all about rocks and water, and the way they have combined to produce the spectacular scenery you see in our Zion National Park Tours site. Like the other great Utah National Parks, Zion is located on the Colorado Plateau, but it alone is near the point where the Colorado Plateau, the Mojave Desert and the Great Basin meet, and this accounts for Zion's amazing and diverse array of flora and fauna. 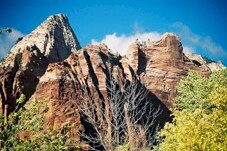 Private guided tours of Zion are also available, from Las Vegas, Salt Lake City, St. George or Cedar City. Zion Tours offers mini bus, coach, van and luxury SUV tour service to Zion National Park, as well as the Grand Canyon, Bryce Canyon, Arches National Park, Canyonlands, Monument Valley and Lake Powell, to name a few. 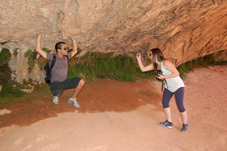 Our Bryce Canyon tour also tours through Zion park. Zion Tours has so many spectacular national and state parks to offer you that you may prefer to make Zion just one stop on a custom multi day tour that includes the Grand Canyon, and as many of the other Parks as you wish.